President's Pride Reports and CPA Contest submissions are due for September 30, 2011.
club presidents or secretary's can file the report online at the optimistleaders.org website. You have to login in and select the "President's Pride" link under the Reports section. CPA submission packages must be delivered to Activities & CPA Chair Marilyn Bushell at the 1st Quarter District Conference where they will be judged. The District winners will be forwarded on to the OI contest. On our District website at www.amsnwoptimist.org we have added some quick pick navigation graphics in the menu column on the right. You will now see graphics for our District "OptiNews" blog, our District Facebook Page, our District Twitter feed, and to "Put Your Club Online"
"Put Your Club Online With Blogger" has been retired and been replaced with "Put Your Club Online" at putyourclubonline.blogspot.com. 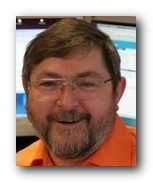 The focus of the new blog is to cover a wider variety of topics and not just focus on Blogger. You should start to see new blog posts appear regularly. 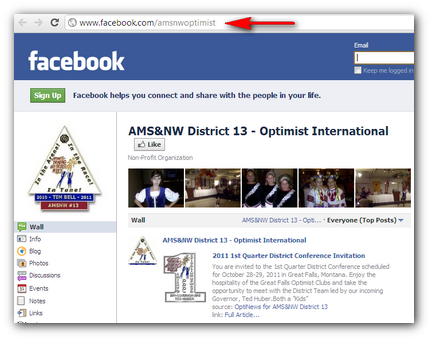 The URL for our Facebook page has been changed to www.facebook.com/amsnwoptimist. If you had links or graphics on your web sites or blogs that pointed to the District Facebook page, you will need to adjust those links. 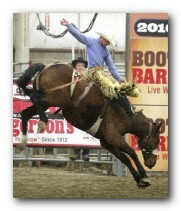 We are in the last month of our Optimist year for 2010-11. On October 1st, our District website will be replaced with a revised site for the 2011-12 Optimist year. Our District facebook page, "OptiNews" blog and Twitter page will also experience some minor adjustments. If there is information that you want to retain, we recommend that you save a copy of online documents and digital graphic files as we cannot guarantee that they will still be available once the switch to the 2011-12 year is completed. At the 2011 District Convention, George Lewko and I presented a workshop on "21st Century Social Marketing at the Club Level". The focus of this workshop was to discuss social networks like Facebook, Twitter, and blogs and discuss how we can use that technology to raise public awareness about our club, service projects and fundraisers that we run, and how to attract new volunteers. During that workshop, we looked at three generations: the "Baby Boomers", "Gen X" and "Gen Y" ... the differences between them and what motivates each generation. I must thank Maggie Fairchild, Director of Social Media at Optimist International, for her original presentation slide deck which I have modified to include the information on the different generation profiles. We would appreciate your comments and suggestions on how we can improve this workshop for future training opportunities. As we close the business portion of this year's Annual District Convention, we have some important information to pass along. Governor-Elect Chosen. 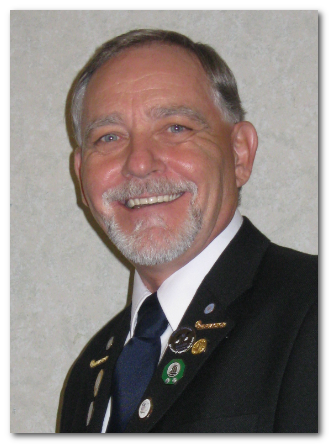 Congratulations go to Nick Markowsky (Prince Albert High Noon Optimist Club) who was elected by acclamation as our District Governor-Elect for 2012-13. 1st Quarter District Meeting. Past Governor Roger Lesofski (Great Falls, MT) has provided some details for the upcoming 1st Quarter District Conference. Next Year's OI Convention. 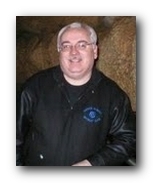 President Danny Rodgers announced that the 2012 Annual Optimist International Convention is scheduled for Milwaukee, Wisconsis. Dates and details will be made available on the www.optimist.org website in the near future. "You are not too old to change." "We need to express our passion about what we do to attract the younger generation to join our clubs and participate in our efforts." "People want to be part of amazing things ... part of something that makes a difference." 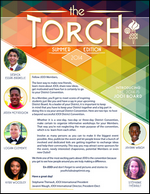 "Focus on sharing the phenomenal things you do with your local community." We need to start reaching out individually and collectively to our club members ... use real old means of communication ... phone calls, personally signed notes, mailed invitations, personal thank you notes. We need to get more personal in our marketing. We also discussed the future of club strength and how it is more important to focus on recruiting and reatining active members in our clubs who participate in club projects ... attending meetings is not important ... serving our communities to satisfy existing needs is where our efforts need to be placed. We expressed an interest in retaining the individual and club recognition programs. 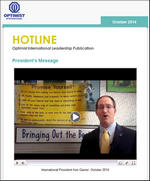 OI is focusing on using technology to reach out to more Optimists to provide online, interactive training. We will try to get that information to you in the near future. President Danny thanked us for reaching out and asked us to continue expressing our passion for the Optimist organization. "It is a privilege to be in the arena with you to fight the fight that we engage in." Welcome from Prince Albert, Saskatchewan! We are gathered at the Prince Albert Inn to share in some fellowship and to pass along some new information. We are pleased to welcome Optimist International President Danny Rodgers who is experiencing the AMS&NW charm on his second visit to our District. We last welcomed President Danny and his wife Jill in 2005 at our convention in Sherwood Park, Alberta. There are six workshops for members to attend, and more in-depth training for the incoming Lieutenant Governors, Club President-Elects and Incoming Club Secretary-Treasurers. Last night we gathered for a 50th Birthday Celebration for the Optimist Club of Prince Albert, who are commemorating 50 years of service to the youth in Prince Albert. I'll be taking some photos and posting updates in our District blog and our facebook page. For those who couldn't make it, this will be your opportunity to experience some of our weekend. If you have a question that you want to pose to a District Chair, District Secretary-Treasurer Marilyn Bushell, Governor Tim Bell or OI President Danny Rogers, please post them to our Facebook page and I will do my best to get an answer for you. Why attend the District Convention? I am a firm believer in the ‘power of three’… a concept that you can best remember important facts, features, ideas, etc if you remember them it sets of three. Our District Convention will be starting in a few weeks in Prince Albert, Saskatchewan hosted by the Prince Albert Optimist Clubs. Meet OI President Danny Rodgers and his wife Jill who are our guests. As Optimist members, we do not often get a chance to meet the president of Optimist International and engage in a conversation on the burning topic that is near and dear to our heart. This would be your chance. Attend Quality Workshops hosted by some of our District Committee Chairs. If you are club president elect or a secretary/treasurer designate, the best training outside of the OI Annual Convention is always provided at the District Annual Convention. If you are an incoming Lieutenant Governor, you get the opportunity to spend an entire day in workshops covering all the information that you’ll need to enjoy a successful year. There is usually a wide assortment of interesting workshops held on Saturday for regular members to attend … all provided to enhance your ability to deliver quality, fun-filled projects and programs in your local communities. Meet the Incoming District Team who will be introduced by incoming Governor Ted Huber and sworn into office by OI President Danny. The most important reason to attend the District Annual Convention is that it is usually a enjoyable mini vacation where you get a chance to enjoy the fellowship with the members from other clubs throughout the District. There is ample time to share experiences and pick the brains of the more experienced Optimist members who will be there. I’ve been attending District meetings for years and I especially look forward to District Conventions as I always feel recharged as we head into the final six weeks of the current Optimist year and we start to plan for the coming year. If you haven’t registered, I ask that you consider attending the District Convention this year. Here’s a new initiative that clubs should be reminded about. 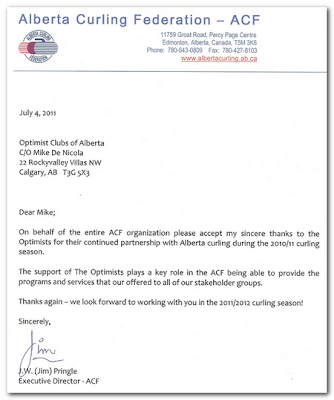 It’s an opportunity to bring funding into your club, which you can dedicate to additional programs or additional members. 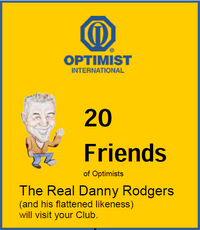 $40 of every $100 Friend of Optimist membership is sent directly to the club. I’ve heard of one club in North Carolina which purchases a $17 engraved plaque to present to businesses who become Friends of Optimists, and the club still receives a net $23 return. Can we challenge our clubs from now till September? Download the full contest details. 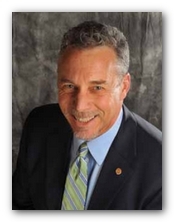 Mike DeNicola recently received this letter of thanks from Jim Pringle, Executive Director.